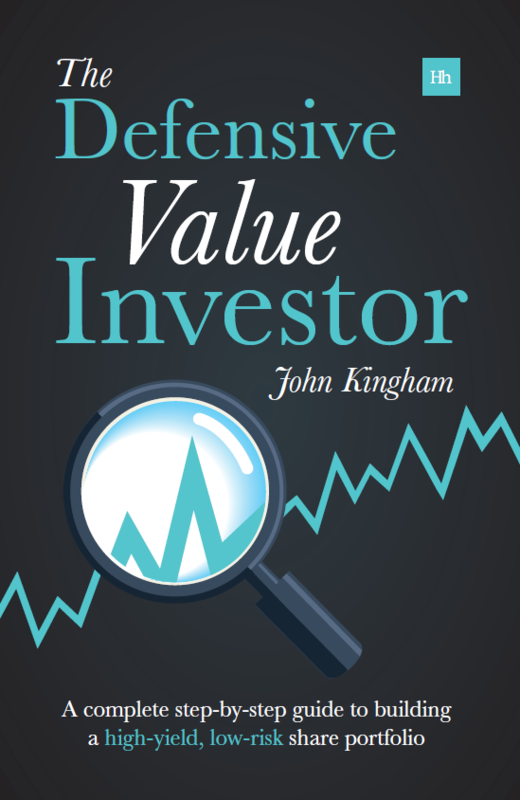 JD Sports was the third holding to join my defensive value model portfolio way back in March 2011. Little did I know then that this small-cap retailer of trainers and all things “sports fashion” would turn out to be by far the best investment over the following five years. Things were not always so rosy though. The company went through a difficult period between 2002 and 2005 following a major acquisition where it purchased 209 First Sports stores for £53m. This was at a time when JD sports had just 166 stores of its own and profits of around £10m. It was a debt-fuelled acquisition and, as if often the case, the combination of large interest payments and distracting acquisition integration efforts proved to be more difficult to cope with than was expected. However, by the time I added the company to the model portfolio in 2011 it had successfully integrated those stores and paid down its debts. The investment got off to a slow start in 2011 and 2012 – due to a weak UK economy and losses from another acquisition – but rapid growth eventually returned and the share price increased dramatically. As a consequence of those gains the valuation is now a little too high for my liking. 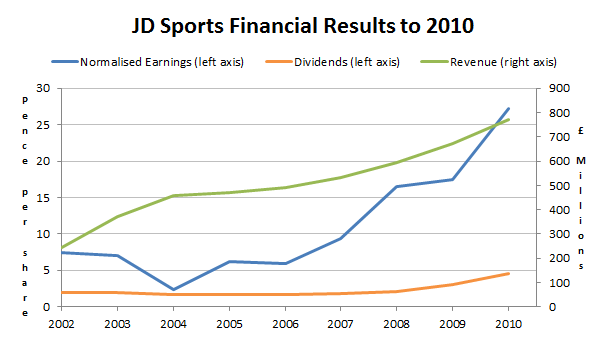 JD Sports’ results in the years before 2011 were a mixed bag. During the first half of the 2000s the company’s profits and dividends had stagnated and declined. The principle cause of this was the very large acquisition of First Sports and its 209 stores. This ambitious growth project turned out to be more difficult to pull off than expected and the new executive Chairman lasted less than a year before heading for the exit. But as the chart below shows (or at least hints at), the new stores were eventually integrated and brought up to standard, the debts were paid down and profitability and profits took off. 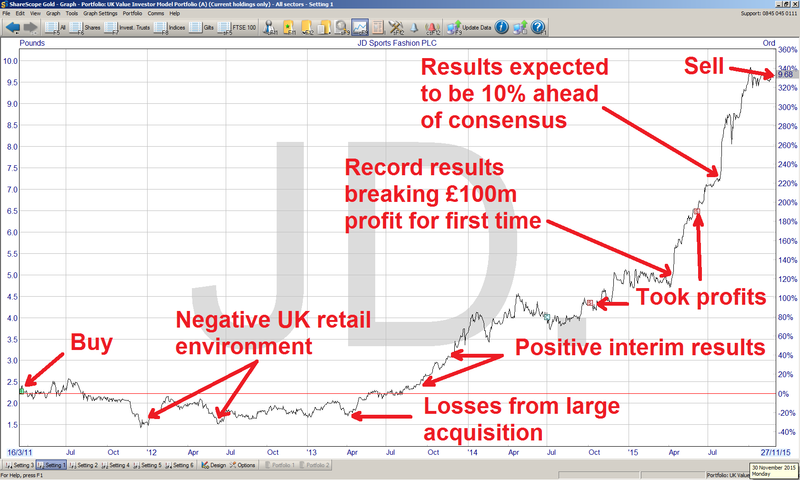 As the subtle green highlighting hopefully shows (indicating the “winner” for each column), JD Sports was a high growth company trading at a reasonable price, rather than a slow growth company at a bargain basement price. The PD10 ratio (price to 10-year average dividend) is highlighted in red because it was far above my rule of thumb maximum of 60 for that ratio. However, I didn’t use that rule of thumb in 2011 and even if I did I may have invested anyway (it’s a rule of thumb, not a hard rule). Why? Because the reason for JD’s high PD10 ratio was its policy of retaining the vast majority of its earnings for investment in future growth (in other words it didn’t pay out much of a dividend), which is an entirely acceptable policy for the small-cap high growth company it was in 2011. Another factor of note which came up during my initial analysis was the company’s acquisition history. JD has a history of making small acquisitions in most years interspersed with the occasional large one (which I define as costing more than than a single year’s profit). As well as the £53m spent on 209 First Sports stores (priced at around 500% of JD’s profits at the time) it also purchased around 180 AllSports stores in 2005, hoovering them up from administration for £15m (about 130% of JD’s profits at the time). The company was clearly more than willing to take on large acquisition projects and their associated risks in order to boost growth. I’m not a big fan of big acquisitions, but even so, I felt that JD Sports was a quality retailer at a reasonable price and so I added the company to the model portfolio. The holding period for JD Sports can be broken down in to two clear halves. The first half runs from the purchase date in March 2011 up until the Q1 interim management statement in June 2013. The second half runs from that date up until today. Throughout that first period, which lasted more than two years, JD Sports did not look like a dazzlingly successful investment. The 2011 annual results announced that “the Board is extremely cautious in its outlook” due to the difficult UK economy at the time. The market was also not pleased with another relatively downbeat Q3 statement later that year. By the end of 2011 the shares were down almost 40% from the purchase price. 2012 was not much better. The year began with the £20m acquisition of Blacks Leisure (Blacks and Milletts) which was expected to produce short-term losses as the struggling company was turned around and integrated. It did not disappoint. Results were also held back as the company’s new distribution centre was brought online. Negativity peaked in April 2013 after the annual results reported losses of £15m on the recently acquired Blacks business (you can see the slump in 2013 group profits in the chart below). At that point the share price was still showing a loss after two very forgettable years. But shortly after that, things started to change. At the August 2013 half year results profits increased massively from the previous (admittedly weak) year, up by more than 100%. This reflected an improved economic environment in the UK, but also that JD’s core sports fashion business had been progressing all through 2011 and 2012, even though various short-term factors had conspired to hide that fact. Through the rest of 2013 those negative factors (including the Blacks acquisition, the weak economy and new distribution facilities) faded and JD’s true potential soon became clear, with the November 2013 Q3 announcement forecasting “earnings at least in line with current expectations”. The 2014 annual results (published in April 2014) were also positive and the share price increased rapidly up to a 100% gain on the purchase price. 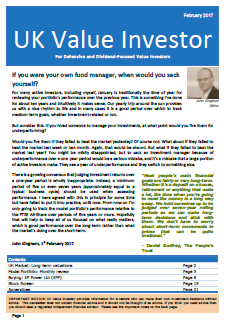 Later in 2014 I sold close to half of the investment in order to take profits and lower risk by reducing its position size from 6% to 4% of the portfolio. However, it wasn’t long before I had to do that again as the share price literally took off after the 2015 annual results. The company’s profits had broken through the £100m barrier for the first time, revenues had gone past £1.5bn and the share price went from 500p to almost 1,000p in just a few months. 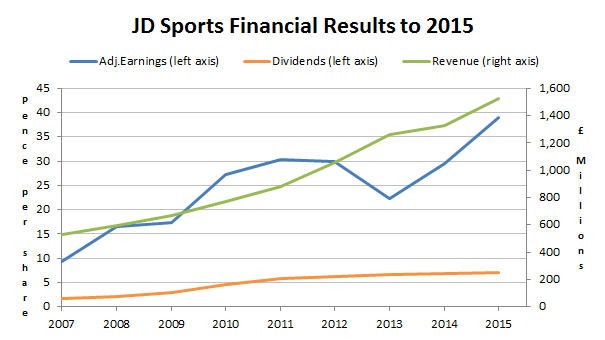 Over the investment period JD Sports has produced a very credible set of results. Its revenues have increased by 100%, its earnings have increased by more than 40% and its dividend has increased by more than 50%. That is very impressive indeed. I also think it’s likely that the company will continue to produce good results. It seems to be a very high quality outfit; very efficient and with deep knowledge about how to run a highly profitable sports and fashion retail business. I admire what they have achieved and I think it’s a great company. After such a rapid increase in share price, is the investment still attractively valued? One the one hand I can argue the case that it is, even though its valuation ratios are now a little stretched. All of which are much better than the market average. So JD’s high valuation is justified, to some extent at least, by its rapid, consistent, highly profitable growth. That’s why, even at its current price of 1,002p, it still has a fairly good stock screen rank of 88 out of the 235 dividend paying stocks that I track. It is also not the lowest ranked holding in the model portfolio and so on that basis is not the obvious choice to sell (I usually aim to sell the lowest ranked holding every other month and then replace it with a more attractive stock the following month). There is a problem with that argument though, at least it’s a problem for me as a value investor. To justify those high valuation ratios you have to assume that the company can continue to grow at strong double digit rates for the foreseeable future. That may well turn out to be the case, but I am not a growth investor and I cannot rely so heavily upon rapid future growth to justify an investment’s current price. I am intrinsically and professionally a contrarian and so when things are going well, I expect them to go badly, and vice versa. This is precisely why I bought JD Sports at a time when it’s future success was far from certain and when it was struggling in a difficult economic environment. Now that its future appears to be paved with gold I cannot help but expect the company to trip up at some point. And such a trip could have catastrophic consequences for an elevated share price. So even though JD was not the lowest ranked stock in the model portfolio (there were three other holdings that faired worse on the stock screen) I have decided to sell it now and lock in those impressive gains once and for all. As usual I will reinvest the proceeds into a new holding in January 2016, although I doubt that JD’s replacement will produce anything like the same results. What an interesting and thoughtful blog. Thankyou very much for such a great post. I am impressed at how you held on at the start despite the large loss. It again stresses how Stop Losses can work against you. Once you were in profit the share price graph shows lots of points where I would have been tempted to bail out. Hi Stephen, thanks. I’m not a big fan of stop losses as you can tell. For me they put the decision-making power into the hands of Mr Market which I’m not keen on. Although a lot of very smart investors swear by them, so they can’t be all bad. As for knowing when to bail out, it’s always impossible to know for sure. JD may well double again from here, but for me the valuations are not obviously cheap so I’d rather have my money somewhere else. Good analysis of the star of my portfolio. Bought September 2013 at 250p adjusted. Sold half at 710 last July as I thought fair value was reached, just before a fine statement came out (dammit). After this weeks statement I plan to sell another half of my existing holding if 1100 is reached. I like to leave a small holding behind while growth is still present. I agree, it will be a tough act to replace this company. Hi Simon, looks like we’ve bought and sold almost in parallel. It will be interesting to see how things go from here for JD. I’m not sure they can do too much more acquisition-fuelled growth in the UK, so perhaps the majority of future growth lies abroad. I think, that You have made a safe decision to sell. The time will show, if it was a good one. It is a very detailed analysis and shed a light, why JD. has produced such superb returns. This walk through the company’s history can be a very good lesson for every value seeking investor. I agree with you, that stock price is very high and I am waiting for a decline. Although, I count, that after a possible correction, there will be a good time to earn more on this company. They show great performance and if the economy won’t slow down, the capital gains are still workable to achieve. As you say time will tell. As for waiting for the price to fall, it would be welcome and I would be quite happy to invest in this company again at the right price.